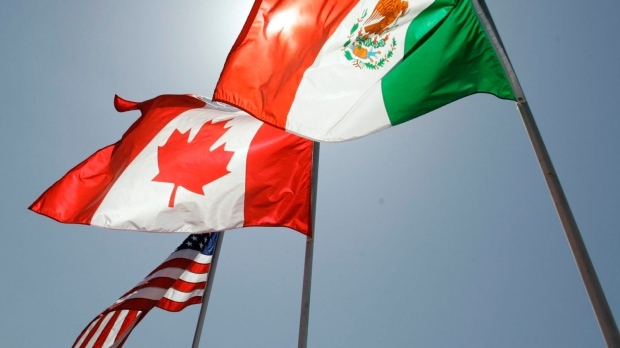 WASHINGTON -- U.S. President Donald Trump's escalating threat to trigger NAFTA's cancellation clause as a high-pressure bargaining tactic has raised the question of what Canada's response might be in the face of a gun-to-the-temple negotiating strategy. Canada should remain at the bargaining table and likely will, for its own strategic reasons, say several insiders, including Canada's chief negotiator for the original NAFTA, the head of the Commons foreign affairs committee, and a cross-border trade lawyer. Their reasoning is shared by some high-ranking officials in the Canadian government who believe the country's interests are best served by calmly sticking it out rather than stomping off and augmenting the presidential drama. It's an increasingly pressing matter. Trump has begun telling people he wants to trigger NAFTA's Article 2205, which allows a country to withdraw with six months notice, because he believes it will scare Canada and Mexico into concessions. One was the country's chief negotiator for the 1993 NAFTA. "As tempting as it might be to say, 'Well, screw you, we're gonna walk away,' I think it would be better to just keep negotiating," John Weekes said in an interview while attending a Washington trade symposium hosted by the Cato Institute. "We'll just say, 'Look, our position is not gonna change at all as a result of this threat. And if you decide after six months or sometime after that to pull the plug it's going to be damaging to your interests',"
Members of the president's own party have begun voicing anxiety. Members of his cabinet have pointed out that a NAFTA pullout threat would be especially painful for the deep-red states that voted for Trump and happen to be major exporters of farm products to Mexico. Republican-friendly business groups are starting to sound the alarm. Eighty-six agriculture groups wrote a letter to the Trump administration this week saying the mere threat of a pullout via Article 2205 would scare foreign customers into seeking new suppliers and "cause immediate, substantial harm." The No. 1 business lobby in the country, the GOP-backing U.S. Chamber of Commerce, will be hosting a pro-NAFTA event next week attended by senators from Kansas and Texas -- Pat Roberts and Ted Cruz. Inside U.S. Trade reported that Trump told a meeting of his party's senators this week not to get "too excited," because he's handling the NAFTA matter and believes he needs to use a pullout threat to get the best possible deal. Trump has made similar comments in public. The site reported that Roberts replied: "I am excited." "It's sort of a consensus on (Capitol) Hill that it's part of his negotiating strategy ... that, 'this is who we have as a president'," said Bob Nault, a Liberal MP whose committee met a half-dozen lawmakers this week. "He'll move towards creating a crisis before too long with the goal of getting everyone's attention that this is serious and he'll want significant changes to NAFTA, or he'll walk away." Nault's view on what happens next: "I think Canada stays at the table. I think it will." An international trade lawyer specializing in Canada-U.S. matters said it's critical the parties keep talking. He said there could be a big battle in Washington over the cancellation of NAFTA -- involving politics, trade policy and the legal limits of presidential versus congressional power. "It doesn't give Congress a lot of ammunition to push back on the president if nobody is there (negotiating)," said Dan Ujczo of the firm Dickinson Wright. "Canada and Mexico should be at the table every time. They should meet whenever, wherever they want and say 'We're ready. We want to work with you.'... The optics of that are so terrible if Canada and Mexico don't show up." Numerous observers expect a complicated and lengthy legal fight if Trump actually tries cancelling a major trade deal, a move unprecedented in modern U.S. history. That's because of an inherent conflict in the U.S. Constitution -- between Article One, which gives Congress power over international trade, and Article Two, which gives the president power over international treaties. "I think it would end up at the Supreme Court," said Bill Reinsch of the non-partisan Stimson Center. "I think it will be litigated."